February Praise Post - CounterCultural. CounterCouture. Oh my days, February has been crazy. Then again, I have a feeling that March is going to be even crazier. So, it’s time for my monthly review of how God has been good to me, even when I don’t realise it. I didn’t manage to get photos of every event so a few of these you will have to use your imagination. Mum and I have signed up for Slimming World online. It was a great start to rediscovering the willpower that I had during #SugarFreeSeptember. I have so far dropped 8 pounds and my size 12 jeans are fitting so much more comfortably. Tying in with the healthy eating theme, I went along to a book signing for Ella Woodward’s new recipe book. Ella is the mind behind Deliciously Ella and the one of the poster girls for plant-based clean eating. The ticket to the talk and book signing was a Christmas present from my parents and it was worth the two month wait. Ella is surprisingly inspiring and though I’m not giving up meat and fish anytime soon (forever the omnivore), I am ready and willing to jump on board the clean eating band wagon. Even better, her cacao and hazelnut spread is ten times tastier than Nutella! I’ve been doing a lot more in the kitchen this month and I’ve been enjoying it. To be honest, I probably spend too much time thinking about or eating food. Alongside the curry I made earlier this month, I’ve been juicing, smoothing, steaming, roasting and grilling my way through February. My favourite has to be chicken coated in bread crumbs, spices and cheese before being griddled. So yummy next to a pile of kale in a spicy yogurt dressing. I spent the afternoon with Annabel wandering around Warminster and watching Wold Hall before celebrating Catherine’s birthday. The birthday girl was incredibly happy with her cake, as you can tell from her massive grin. I am determined to try and pass my driving theory test this year. I’ve finally found the motivation to get over failing first time around and that is all down to God… well, and my mother’s reminder that I’ll be stuck when she and Dad go on holiday. This photo seems ever so random but it’s in there as a reminder that I had at least one night when I could just chill. 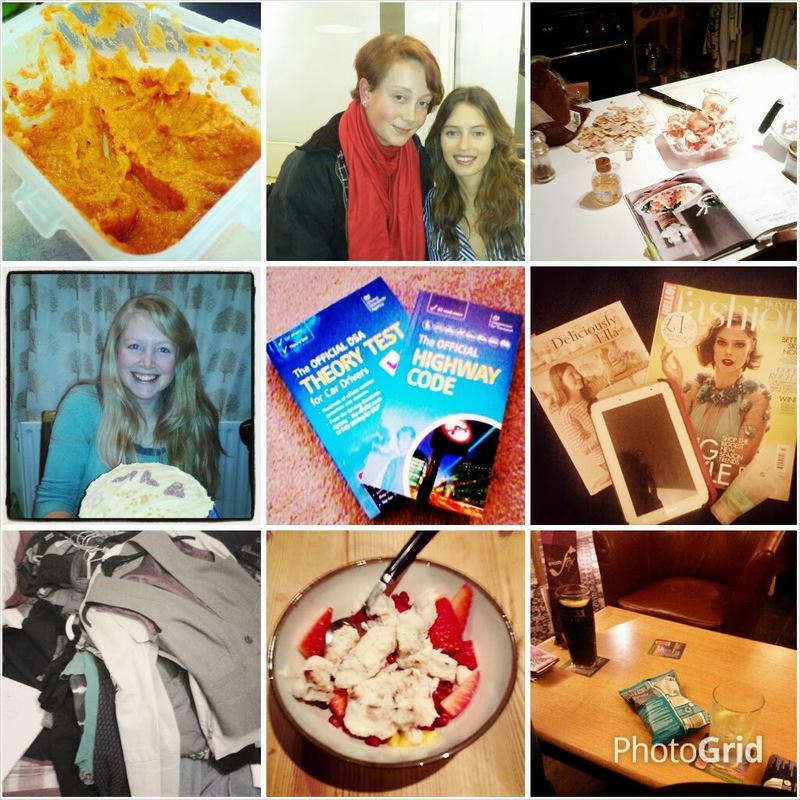 It was just one night of reading whatever I fancied, from catching up on blogs and fashion through to Ella’s cookbook. I even managed to have a face mask while watching TV. I feel like this was a small miracle! You might have noticed on Instagram that my wardrobe has shrunk massively. Sorting out my clothes for #6ItemsChallenge was incredibly refreshing and has made me realise just how much I own that I don’t need/wear. So come the end of Easter, the local Red Cross might be gaining a big donation! Slimming World ice cream with a big bowl of fruit! Oh so good! Freeze two low fat yogurts with chocolate bars- I used kinder bueno- crunched up in them. Oh, it was so good! I just love how the hazelnut filling became all chewy and the fruit was so refreshing with it. A catch up with fellow slimmer Helen was just the pick me up I needed after the busy-ness of February. And yes, we spent the night promptly falling off the slimming wagon. Sometimes you just need a night at the local pub with a glass of wine and a packet of crisps. So what happened that I forgot to photograph? From a trip to London to catch up with Jess, a house party with Fee, James and company, it has been an incredibly social month amidst the craziness. I even managed to get a little bit of networking in for my inner blogger with a trip to #BlogClub. Along with catching up with Gina, Rosa, Emily and everyone else, I also learnt so much about Google Analytics. I just need to put it into practice now. So that was my February. It has been a great month looking back with dozens of fab opportunities. God has been good to me. The post February Praise Post first appeared on CounterCultural. CounterCouture. ← Introducing || Hashtags Galore!